Pumpkin Spice Cut Out Cookies start with a basic cookie dough to which pumpkin spice is added. Cut them out then decorate with pumpkin colors and these are festive and fun for pumpkin season! The season of pumpkins is all around us and this month the #CreativeCookieExchange is happy to share our favorite pumpkin cookie recipes. Bake it with pumpkin, shape it like a pumpkin, add some pumpkin pie spice–whatever is your favorite cookie we’d love to know! 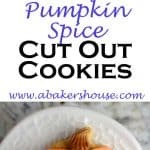 I went overboard on pumpkin with these cookies as they fit all three of those descriptions: pureed pumpkin is in the ingredient list, you can cut out this dough to make adorable pumpkin shapes, and to boost that pumpkin feeling I also added pumpkin-friendly spices like cinnamon, nutmeg, and ginger. It’s funny how pumpkin pie spice makes us think more of pumpkin pie, pumpkin lattes and other pumpkin treats more than the actual PUMPKIN itself. Check out this quick lesson on making pumpkin pie spice from The Kitchn then customize the spice mix to make it your own as I did in the recipe below. For these cookies I started with my favorite cookie creator’s recipe by Bridget from Bake at 350. 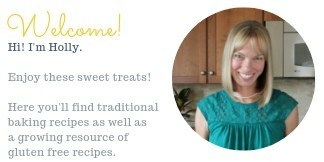 She is a master of all things cookies! 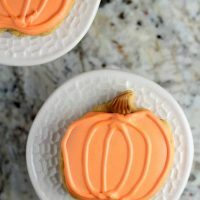 I used her standard sugar cookie recipe as my starting point then added ingredients to create this pumpkin spice cookie. Baking with pumpkin puree reminds me of baking with applesauce; it lends a softness to the cookie you wouldn’t otherwise have. Still, the combined ingredients resulted in a strong yet forgiving dough when rolled out and a firm enough cookie once baked to stand up to the layer of royal icing on top. Pumpkin Spice Cut Out Cookies start with a basic cookie dough to which pumpkin spice is added. Cut them out then decorate with orange icing! Stir together the flour, baking powder and spices in one bowl. Set aside. In a stand mixer or with an electric hand-held mixer, mix the butter and sugar until combined. Add in the egg, beat until incorporated. Finally add the vanilla and pumpkin puree and mix until well-blended. Add the dry ingredients to the mixture in the stand mixer bowl in three stages-- add a bit then slowly mix, add the next and mix then add the final amount and mix. Bring the dough into a round, flat circle and wrap in plastic wrap. Refrigerate for 30 minutes. Lightly flour a surface and roll out the dough to a 1/4 inch thickness. Using a cookie cutter cut shapes from the dough and gently place them on a baking sheet covered with parchment. Leave space between cookies (8 cookies per tray will be plenty). Bake at 350 degrees for 10-13 minutes then remove and cool on a wire rack. I used this royal icing recipe which is also from Bake at 350. I did flavor it with 2 teaspoons of maple syrup rather then the light corn syrup listed in the original recipe. Orange gel food coloring brought these pumpkin to life and a small brown stem added character as well. I first iced the pumpkins in orange by lining the shape with a thin line of orange icing and filling it in with the same color. After about 30 minutes the icing was dry enough to add a second layer. I used the same color and added curved lines to enhance the pumpkin shape. Let’s see what the group has created– so much PUMPKIN goodness! The theme this month is Pumpkin! It is only October–you can’t possibly be tired of this glorious symbol of the fall harvest yet! If you are a blogger and want to join in the fun, contact Laura at thespicedlife @gmail.com and she will get you added to our Facebook group, where we discuss our cookies and share links. Adorable little pumpkins . Sure they taste just as good as they look ! Beautiful cookies and wonderfully decorated. This is a cookie I would buy from the bakers! So pretty and the pumpkin flavor is a bonus! Oh thank you! Yes, I think the pumpkin flavor was a fun addition too. They look so beautiful, Holly! Perfect for this season. Thank you, Ansh, it was fun making these pumpkin shaped cookies. Holly, you are amazing! I am so impressed! These are so gorgeous! Your cookies are beautiful. You are too kind, Karen, thanks! It’s a pumpkin hat trick—win, win, win! These are so cute–I love the decoration and how you adapted the recipe. 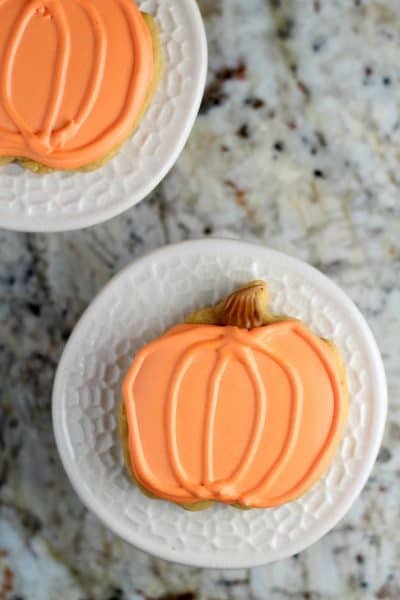 These cookies are adorable and perfect for fall! They sound deliciously pumpkiny and I love how you adapted a favorite sugar cookie recipe. Yum! You always make gorgeous cookies. I wouldn’t have the patience, but I’m so glad you do! What a great seasonal recipe!